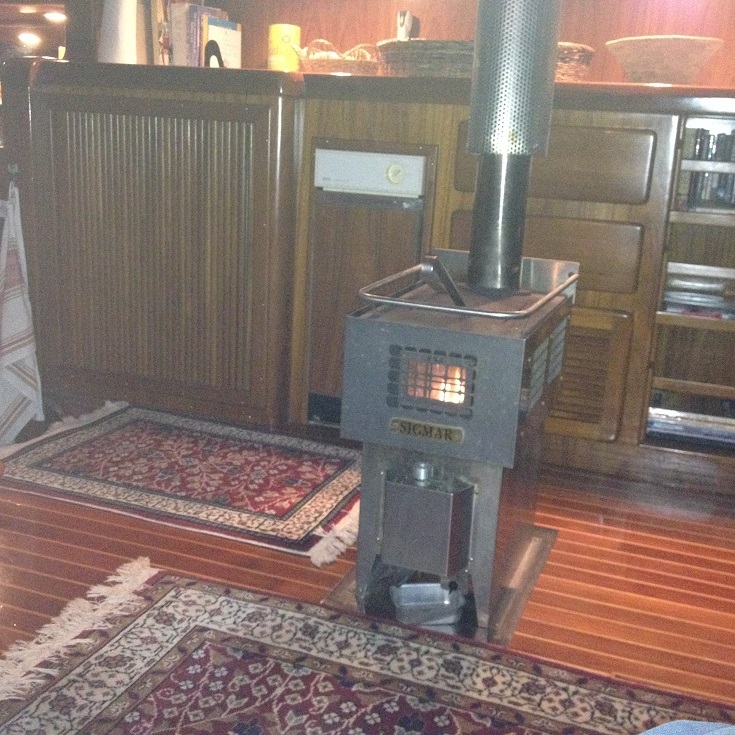 As mentioned before on this blog Dora Mac has already two separate heating systems. The Cruisair aircondition reversed heating system consists of two units (one 16.000Btu for saloon/pilothouse and one 12.000Btu for aft cabin). Allthough efficient in heating up the boat with it´s outlets high up (cold air sinking) this system is mainly designed for aircondition cruising in the tropics. Consuming high amount of batterypower you need either shorepower or if at anchor-generatorpower. Allthough wired through the inverter you can only run the system a couple of hours while under way until the message "overload" comes up on the Victron display. The Sigmar dieselstove is a simple and independent cabinheater. Once fired up it warms the saloon nicely (obviously not the aft cabin) and creates a cosey atmosphere. The backside is it´s problems with strong winds while at anchor creating "backfires" and a smokey cabin. For this reason also problematic when used while under way. Heading for high latitude cruising the coming season north of the polar circle, we do need one more system completely reliable while under way,being at anchor and/or on shore power. Several other Diesel Ducks cruising Alaska and Pacific North West have installed hydronic heating systems (Webasto or Eberspächer) and seems to be happy with these systems. That was also what I had in mind when meeting up with the technical expertise at the yard in Kärdla. Basically it´s a dieselheater heating up coolant which is circulated through radiators/fans spread strategically through the boat. The alternative is an airtronic system which brings in fresh air to a dieselheater and then warm air is spread with fans through airducts piped through the boat. After having spent a day onboard Dora Mac checking out the circumstances and discussing these two options I´m still confused. As usual in the boatworld it´s a compromise and both systems have their pros and cons. 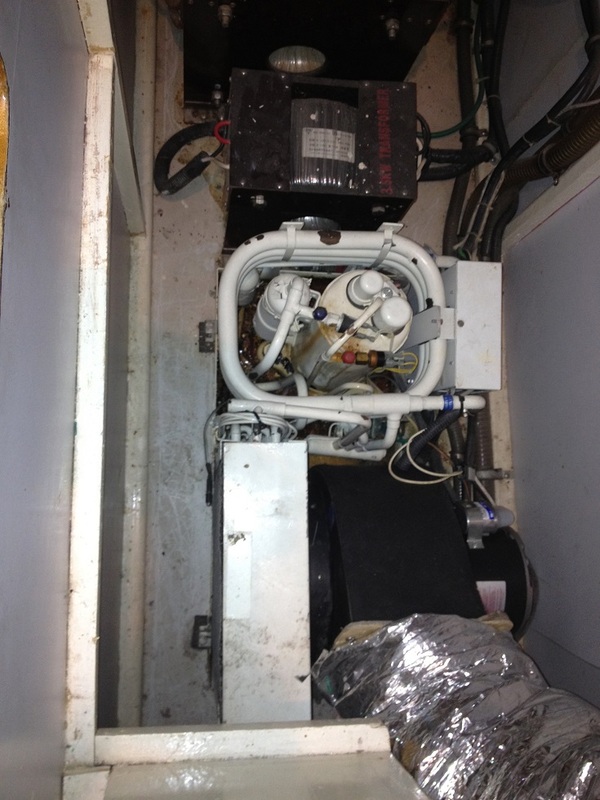 The hydronic system will have capacity to heat all of the boat better. The diameter of it´s piping is less,and many liveaboards prefer this system for it´s quality of the warm air being better-"it feels more like home". On the other hand it consumes 6 amps/hr compared to 4amps for the airtronic system,and 1-1,5 liter fuel/hr compared to 0,5-0,7 for the airtronic. Allthough not capable of heating up all of the boat as well,the airtronic system heats faster. Allthough not considered to give as good quality of warmth the airtronic system will also keep the boat much dryer without condensation and mould. Finally the airtronic system is less complicated to install. I will have to make a decision this week and currently my mind is more set towards an airtronic system. If so, Dora Mac will be the first Diesel Duck 462 with an airtronic system which will be interesting for future experience. Pictures of DM`s current heating systems below.